The talking points below are written in plain language as a suggested way to communicate concepts of drug use and addiction to the intended adult or teen. People use drugs for many reasons: they want to feel good, stop feeling bad, or perform better in school or at work, or they are curious because others are doing it and they want to fit in. The last reason is very common among teens. Marijuana: You might forget things you just learned or have trouble focusing. may slow to dangerous levels, leading to coma or death. to dangerous levels, leading to coma or death. get dangerously high, or you may have an irregular heartbeat, heart failure, or seizures. paranoid, or have a heart attack. and have problems with attention, memory, and sleep. reality; frightening flashbacks can happen long after use. person can suffer heart failure and death within minutes of sniffing a lot of an inhalant. Many drugs can also make driving a car unsafe. Marijuana can slow reaction time, make you judge time and distance poorly, and decrease coordination (how you move your body). Cocaine and methamphetamine can make a driver aggressive and reckless. Certain kinds of sedatives, called benzodiazepines, can make you dizzy or drowsy. These effects can lead to crashes that can cause injuries and even death. Drug addiction is when you can’t stop taking the drug even if you want to. The urge is too strong to control, even if you know the drug is causing harm. The addiction can become more important than the need to eat or sleep. The urge to get and use the drug can fill every moment of your life. The addiction replaces all the things you used to enjoy. A person who is addicted might do almost anything—lie, steal, or hurt people—to keep taking the drug. This can lead to problems with your family and friends, and can even lead to arrest and jail. 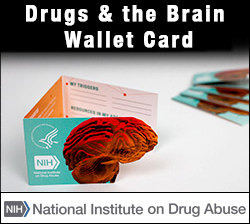 You can get addicted to illegal drugs as well as prescription drugs if you misuse them. Drug addiction is a chronic disease. That means it stays with you for a long time, even if you stop using for a while. It doesn't go away like a cold. A person with an addiction can get treatment, but quitting for good can be very hard. Can I just use willpower to stop using drugs? At first, taking drugs is usually your choice. But as you continue to take them, using self-control can become harder and harder; this is the biggest sign of addiction. Brain studies of people with addiction show physical changes in parts of the brain that are very important for judgment, making decisions, learning and memory, and controlling behavior. Scientists have shown that when this happens to the brain, it changes how the brain works and it explains the harmful behaviors of addiction that are so hard to control. If I stay off drugs for a while (e.g., in the criminal justice system or in residential treatment), will it be easy to remain drug-free? Sometimes people quit their drug use for a while because they’re away from triggers that remind them about their drug use. Away from home, drugs might be less available. Once you go back to normal life, you’re likely to start using again unless you take action to avoid your triggers. This return to drug use is called a relapse. People recovering from addiction often have one or more relapses along the way if they don’t take steps to avoid their triggers. A trigger is anything that makes you feel the urge to go back to using drugs. It can be a place, person, thing, smell, feeling, picture, or memory that reminds you of taking a drug and getting high. A trigger can be something stressful that you want to escape from. It can even be something that makes you feel happy. People fighting addiction need to stay away from the people and triggers that can make them start using drugs again, just like people with breathing problems need to avoid smoke and dust. People who have stayed sober for a while, either because they were in jail or in treatment, should know that they are at a high risk of overdose if they relapse and take the same amount of drug they used to. Their cravings may not have decreased, but their tolerance has, meaning their body can’t handle high doses of the drug anymore. Without immediate treatment, overdose often leads to death. This is why you often hear about people dying of an overdose soon after leaving rehab. What makes people more likely to get addicted to drugs? Trouble at home. If your home is an unhappy place, or was when you were growing up, you might be more likely to have a drug problem. When kids aren't well cared for, or there are lots of fights, or a parent is using drugs, the chance of addiction goes up. Mental health problems. People who have untreated mental health problems, such as depression or anxiety, or untreated attention deficit/hyperactivity disorder (ADHD) are more likely to become addicted. They might use drugs to try to feel better. Trouble in school, trouble at work, trouble with making friends. Failures at school or work, or trouble getting along with people, can make life hard. You might use drugs to get your mind off these problems. Hanging around other people who use drugs. Friends or family members who use drugs might get you into trouble with drugs as well. Starting drug use when you're young. When kids use drugs, it affects how their bodies and brains finish growing. Using drugs when you're young increases your chances of becoming addicted when you're an adult. Your biology. Everyone's bodies react to drugs differently. Some people like the feeling the first time they try a drug and want more. Other people hate how it feels and never try it again. Scientists don’t have a test yet that will predict how each person will react. Yes. People who get treatment and stick with it can stop using drugs. They can change their lives so they don't go back to taking drugs. But they have to try hard and follow the treatment program for a long time. Recovery from addiction means you have to stop using drugs AND learn new ways of thinking, feeling, and dealing with problems. It’s best not to use in the first place. If you do get addicted, it’ll be a long and difficult road. You have to relearn how to live without using drugs. You have to work on the problems your drug use caused with your family, your job, your friends, and your money. You have to stay away from people you used drugs with, and places where you used. You have to learn what makes you want to take drugs again (your triggers), so you can avoid or work on those things. or other mental health problems. You can call 1-800-662-HELP (4357) (toll-free) or go to findtreatment.samhsa.gov at any time to find drug treatment centers near you. If a person is in medical crisis, someone should drive them to the emergency room or call 911. This is particularly true for someone overdosing on heroin or a prescription opioid medication.